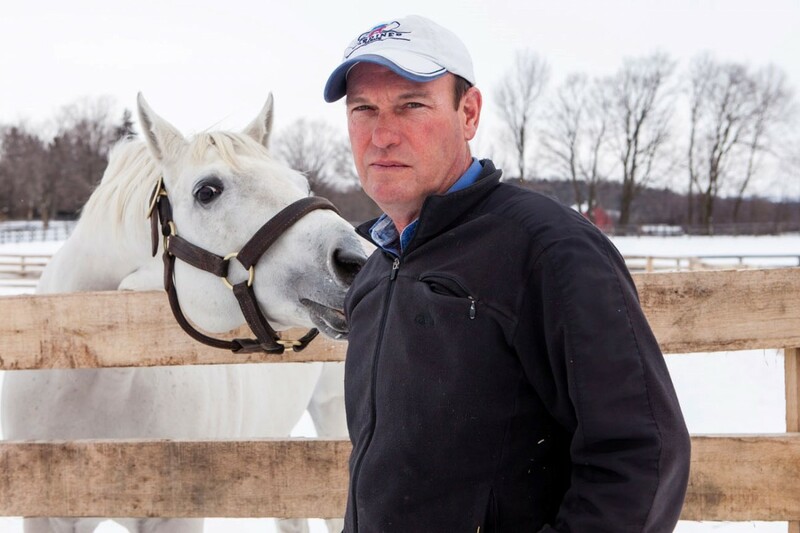 Born in Edinburgh, Scotland, and raised in Lindsay, Ont., where his father Duncan was a family physician, Michael Colterjohn grew up around horses, fostering an equestrian passion which after his graduation in 1985 from the Ontario Veterinary College, inspired a career as one of Canada’s top equine reproductive veterinarians.? His early apprenticeship was with Standardbreds in Kemptville, Trois Rivieres, Ottawa and Montreal Hippodrome before moving to Ontario and opening his own veterinary practice, working with horses on the OJC circuit. He was hired by Gardiner Farms in 1987. In 1990 owner George Gardiner asked his vet to run the Thoroughbred racing and breeding farm. A unique ownership deal in the operation of Gardiner Farms was made and Dr. Colterjohn, who earlier was involved in the acquisition of the stallion Bold Executive, slowly added to the small broodmare band. Under his management, and with farm manager Sherry McLean, the Caledon East farm became one of the country’s most respected breeding operations, prompting the demand for yearlings bred, raised and sold by Gardiner Farms. ?Stakes winners included Kitty’s Got Class, Legal Move, London Snow, Midnight Shadow, Rare Friends and Top Ten List. Gardiner Farms won a Sovereign Award as Outstanding Breeder of the year in 2012. Following the pending sale of Gardiner Farms in 2008, Colterjohn along with his wife, veterinarian Dr. Moira Gunn, purchased the Gardiner-owned livestock he had spent so much time and effort amassing and they continued breeding under Paradox Farm Inc. The list of Paradox-bred horses include 2014 Queen’s Plate winner Lexie Lou along with Sovereign Award winner Pender Harbour. Dr. Gunn summed up her late husband’s philosophy and dedication to the horse racing industry, saying “He felt strongly that breeding horses was as much about helping other broodmare owners succeed as it was about Gardiner Farms or Paradox’s success. Mike wanted to make stallions accessible to the smaller breeders. He helped many people select mares, select crosses, and develop better yearlings for the market. His focus was to help the Ontario-sired product reach the highest level of success. He succeeded for Gardiner, Paradox and himself, and along the way he also helped elevate many other breeders, the OSS program, and the sales.” Dr. Colterjohn died in 2012.